← Kendrick Lamar’s “Control” Verse: Falling on Deaf Ears? Great melodic art is easily discernible and has the ability to take on many different mediums. Music can’t be caged into a genre, when it’s great people refer to it through its transcendent energy, spirituality, and wisdom. Those that can move us produce tunes the flow with life, tunes that can create a pulse, tunes that define people. The evolution of Hip Hop isn’t simply grounded in mainstream’s acceptance, but the development and nourishment of the artistic elements housed first in a neglected community. Hip Hop dance, art, sound, and lyrics have become so dynamic just about every culture around the world has tapped into its harmony, producing a music broadly placed under the Hip Hop umbrella, but specifically binds the world through one rhythmic language. Nevertheless, delving into the discussion of musicianship Hip Hop seems to be placed on a separate table from “respectable” music. 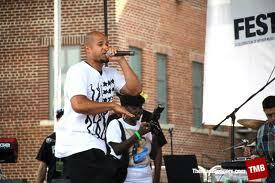 Rarely Hip Hop artists are seen or mentioned in the same vain as Classical pianists, Jazz trumpeters, or Opera singers. Perhaps it’s the youthfulness of the music, the creative integrity relinquished to the sale of the art, or maybe lack of artistic development and little music credentials for some of the more popularized Hip Hop artist? Whatever the reason maybe, the movement to improve the public’s perception of Hip Hop starts with rappers honoring their own craft. So for an innovator like Homeboy Sandman this means he’s more than just a rapper, he’s a musician responsible for telling diverse stories. credibility, lays out self-reflective practices for improvement, and incorporates his voice as an instrument, not simply a sounding board for rhetoric. All I Hold Dear, bars in a combination of quality sound, lyricism, and raw emotion. Entirely produced by M Slago, the album has a walker’s pace and tapper’s passion. A number of the songs sweep you into a b-boy stance, but “Musician” politely refines the subconscious and reduced perspective of Hip Hop music most listeners won’t even admit to. Sandman interjects how irrational someone would be if he overlooked the genius of Hip Hop pronouncing, “16 bars three verses long, that’s the output of a Beatles album in one song/No disrespect to Bob Dylan, but mad respect to Madvillian.” “Musician” inserts Hip Hop on the same shelf as Beethoven and Mozart because the art deserves to be acknowledged as culture changing, intellectually dynamic, and linguistically extraordinary. Sandman demands respect for the beauty that Hip Hop spawns as he asserts, “Top level of dope art: Black Thought, Ray Charles, Miles, and Mozart/Might make the airwaves/ Musical selection on British Airways don’t take no part…” Without a question more than less of us digest Hip Hop and respect is due, but many still choose to separate Hip Hop from the greats in other genres of music despite it being one of the most powerful art forms in the world for the last twenty years. Dropped in May 2013 Boy Sand laced this album with beautiful melody and rhyme that dug deep. Kool Herc was honored. album to Kool Herc. The entire album, produced by El RTNC, jogs your memory of all that is pure about Hip Hop: the people you love, the things you love to do, and believing in yourself despite any trauma you may have experienced. Though there are many jewels laid out on this album “Men Are Mortal” brings you close to the concept of Kool Herc: Fertile Crescent. The track holds true to the lyrical magic and wordplay Sandman is known for. 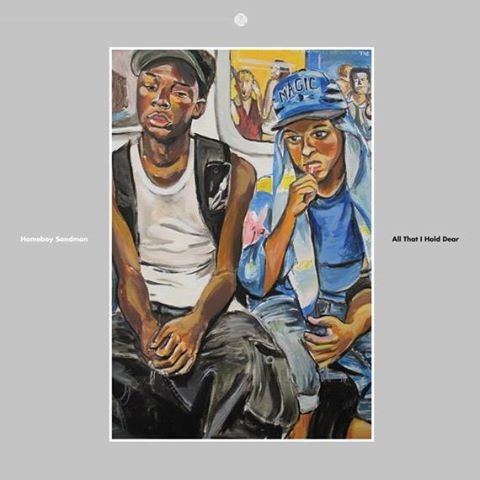 Jagged references of light-hearted Hip Hop artists like Kid N Play, championing mental and physical distress, and simple displays of man’s endurance being more than what he believes. The spitfire rhymes intertwine these many different concepts into abundantly energetic verses that only seem to end because Sandman remembered he wasn’t breathing for a couple of minutes during this meditative flow. Each verse, perhaps a spiritual stew in a jumbo pot, boils down to all the unattractive and inviting elements that make us human beings: the guilty pleasures that trap us, make us mortal, and unable at times to aspire to greatness. Moreover, the song encapsulates Sandman’s elegant swag by asserting at the beginning of each verse, “In that case I’m not a man…” He doesn’t only hold Hip Hop to a high standard; he expects to practice what he preaches. 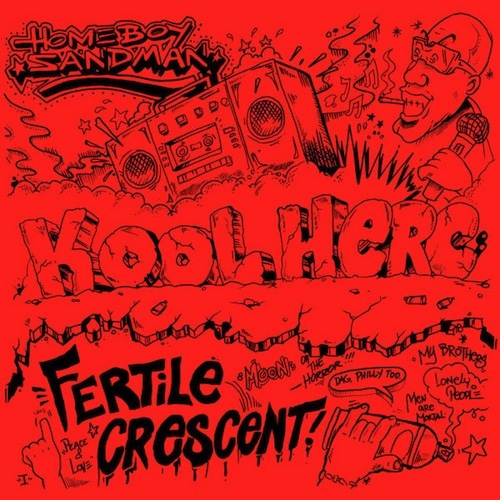 Kool Herc: Fertile Crescent is an amazing tribute to one of Hip Hop’s legends, and Sandman delivers a gem. just excuses for me to release as many of the billions of unreleased songs I have as possible.” I guess the work of making art should come naturally and good artist, among other things, should have a billion examples of their work, right? His live performances have become his staple, and Sandman makes an effort to tour as much as possible. He’s played just about every major Hip Hop festival in the United States and started to become a regular on the European circuit as well. Concerts adds to his art work, as if lyrically you didn’t get enough to savor and bop your head to, his onstage presence is exuberant and gives everything to crowd leaving himself just a little of his voice and energy to communicate with his crew. At the end of every show Sandman walks away exhausted with the belief that he’s presented the art of a rap musician, art that should be enshrined with all the musical greats. this is phenomenal man. i love it. thank you. i can’t thank you enough homey. just posted it to my Facebook fanpage. this is an honor man.